I want to rave about your Grimeinator® product. I live in Juneau, Alaska and we hike in the mountains each week and I have never been as happy as I am now that I have found this product. The Groomers Edge Grimeinator® is just magic. I have a 100 pound Great Pyrenees and a lot of fur. I was visiting a friend after a hike and we bathed our baby and she has never been so fresh. She stays fresher longer. I have noticed such a difference that now I will never use anything else. Thank you so very much for such a wonderful product. You have made a dog mom very pleased. We used this on a young Highland bull, his very first wash. In fact he will be 2 years old beginning of February and is due to be sold in Oban. He had greasy hair and was quite soiled. I am happy to say he came out looking well washed, cleaned and his coat had a gleam to it. We did dilute this using two gallons instead of one and I can say we were very impressed with the effect. It certainly removed the dirt and grease quite easily and because this was his first wash felt that speed was essential. He smelled much better, his coat shone and was fluffy. He is a golden colour and it seemed to bring out the highlights. We will have no hesitation in purchasing this product in the future. Thank you for giving us the opportunity (to comment). We started using Grimeinator two years ago for one reason, "cigarette smoke". At a trade show in Burbank, CA two years ago someone put the Grimeinator® sample in my bag. When I got back to work the following week I decided to put it to the test. I have been grooming for twelve plus years and have not found a shampoo that could remove the smell of cigarette smoke from the pet's coat. After using Grimeinator® on two regular clients that I never have been able to remove the smoke from I was sold. Not only was the smoke smell gone but the dogs smell great and feel great. I now use Grimeinator® as a primary shampoo in all of our mobile grooming salons. This is a remarkable shampoo! I received a sample of Grimeinator® shampoo at Superzoo. I have been grooming for 20 years and to say the least I was skeptical. Well, after using Grimeinator® on a cocker that I always have to shave before the bath, not because he is long or matted but he is always so dirty and greasy, well I decided I would not clip him first, I would just try the Grimeinator® shampoo on him and WOW I just couldn't believe this shampoo worked so well on this dog. I am sold. I will always have this shampoo in my shop. This looks like a job for Grimeinator®! I wanted to take a quick minute to thank you for talking to me about your Grimeinator® shampoo yesterday. After trying a sample I had received in the mail on my own hunting dogs, I decided to start using your product at my grooming shop. Not only does the Grimeinator® get the dogs clean, it leaves their coats soft and manageable and it smells great too! It is in no way a harsh product and we have found that it can even be used on dogs with allergies and other skin afflictions. Our bather, Laurie, whom we lovingly refer to as our "Grimeinatrix" (really, we even got her a tee shirt made that says that), loves the fact that your product is concentrated and a little bit goes a long way (as the owner, I like the savings!!) She loves it when we get extremely dirty dogs in the shop and has actually been overheard saying "This looks like a job for Grimeinator®!" Again, I want to thank you for developing such a wonderful product line and look forward to trying your other specialty shampoos. Keep up the good work!! I recently opened a new shop and have been looking for a shampoo that did what the ad said. I saw your ad for Grimeinator® in Groomer to Groomer magazine and called to inquire about the free samples. We were hooked on Grimeinator® after the first shampoo. What a wonderful product! The smell was wonderful and the dog's coats look great. I absolutely love it. I got a sample with my new dryer and diluted it way down. I used it on my own dogs and could not believe it. After only one wash they were shiny and beautiful. I have been grooming for over eight years and after using many shampoos, I have to say that the Grimeinator® is fantastic. It save me money! I dilute it way down and it still only have to wash the dogs once instead of 2 or 3 times. I was hiding it from my business partner Angie ( A groomer for over 15 years who used to groom Bill Cosby's show dogs) and when she found it and used it she told me she had to have it. I have a 2 year old Newfoundland named "Hjerteknusern Esther Williams" and just by chance I decided to give her a bath with the new shampoo from Groomers Edge: the Grimeinator®. The coat got so shiny and silky that the judge commented on it in the show. We received CAC and got BOS. 2 weeks later, her coat is so shiny that we get very positive comments from people we meet during our daily walks. Recommended from us here in Norway. Just to say that after buying just about every shampoo on the market (and then some) for our Afghan hounds, the Double K Grimeinator® is the best I've ever used. So many deep cleaning ones dry the coat out, and too many don't lather up at all making it difficult to really get the coat clean. I hope they keep from altering the ingredients. So many products seem good at first, but gradually go down hill as the contents are changed. The smell is lovely and it leaves the coat so nice and easy to manage. It does what it says, and I'm so pleased you now stock this range of shampoos and conditioners! I have been grooming for 28 years and a shop owner for 26 years. During this time I have used many different shampoos. When I received the sample of the "Grimeinator®" I was happy to try it. When a filthy Beagle came in I knew it was the perfect dog to try it out on. As soon as I sponged the shampoo on the dog instantly the dirt was coming off. I was amazed to say the least. No need to use a degreaser on the ear leather as the grime was disappearing as soon as the shampoo touched the ear. Well since then that's the only daily shampoo I use. I also noticed that when the bathers accidentally got shampoo in the dogs eyes the eyes did not become irritated and our hands weren't getting dried out either, so it's very mild. The dogs coats also seemed to look shinier, felt softer and customers have started noticing and commenting on how nice the dogs looked. It's reasonably priced and it's a 32:1 concentration. I now use it in my Prima shampoo system and it dilutes down even more with the same results, as soon as the shampoo sprays out of the hose the dirt just starts coming off the dogs. So overall I'm hooked on "THE Grimeinator®." I was sent a 4 oz sample of Grimeinator® last week. I had heard from www.doggroomer.com how great it was on Cockers and once a year grooms. I did not have any cockers or OAY dogs this week and really wanted to try this shampoo. I have used it on a few of my regular clients. These dogs are not known to be very dirty. I was shocked at the amount of grime that comes off these dogs. I use the hydro surge system and very dirty oily foam builds up. There is not a lot of foam using the hydrosurge (or recycling shampoo system) but what foam there is very dirty. I have been grooming for about two years, I have never seen a shampoo that cleans so well, yet does not strip the dog. The coat is still soft and shiny after the first bath. 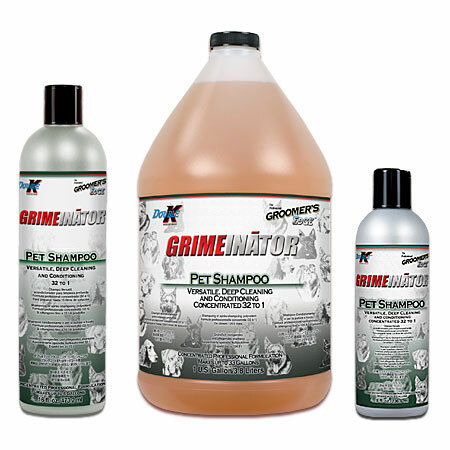 I have decided to make Grimeinator® my first shampoo for every dog. I just ordered two gallons from PetEdge and my sample bottle is not yet gone! I also love the Refurbish conditioner! It really helps with removing the undercoat. I was AMAZED at the quality of this product! I recently used Double K's Grimeinator® Deep cleaning and conditioning shampoo here in my grooming shop. I was AMAZED at the quality of this product! It not only smelled pleasant, it made even my dirtiest clients "Squeaky Clean"! My customers were very happy...and that makes me very happy! Thanks Double K! I breed and show long-haired Persian cats. I have used various grooming shampoos through the years and find Grimeinator® shampoo does the best job getting the oily residue off the coats while adding lustre and softness. My cats now have the long, flowing coat they are known for! I noticed that a lot of groomers were writing in about how much they loved the new Grimeinator® shampoo and I thought I'd let you know how much I love it also! I have a client with a German Shephard that spends every day at his owner's garage. He lies in oil and grease all day long... anyway, he usually takes at least five baths to come clean. I saw Grimeinator® advertised and bought some immediately to try on "Jake" ... what a miracle!! He now takes only 2 baths, possibly 3 on really bad days but this shampoo is amazing! It does just what it says, it fights grease and dirt! I will never be without it in my shop, I have been a groomer for 28 years and it is my favorite shampoo! PS. You should see how well it works on greasy cocker spaniel ears!! I have been grooming for 30 years and am the co-owner of the Central Florida School of Dog Grooming. For many years we have received products to test all claiming to be the "Greatest" or "Best". True to your advertising, The Grimeinator® shampoo is the best shampoo we have ever used. The coats were left fluffy, not dry. The scent is very pleasant and the residual results lasted at least 5 days. You have a REAL WINNER. It should be called "THE ULTIMATE Grimeinator®". Thank you for producing quality products.